Ahead of the national referendum taking place early in June, the Swiss city of Lausanne has adopted a motion to test a basic income and assess the effects of the policy. Will Lausanne be the first city in Switzerland to test a basic income? It is possible. Last Tuesday, April 12th, the City Council took an important first step, when it adopted a motion (pdf) aimed at running a basic income experiment. This non legally-binding motion – which asks the Executive Council of the Municipality to implement a pilot – passed by a close margin (39 votes in favor versus 37 against, with 8 abstentions). Recent polls conducted in Switzerland bolster Porchet’s contention that a basic income would “encourage activity” rather than subsidize laziness, as some detractors fear. These polls conclude that only 2% of Swiss people would stop working if they had a basic income, while 22% would become entrepreneurs and 54% would take opportunities to improve their qualifications. Although the Lausanne City Council’s motion remains vague about the specifics of the experiment, it proposes that it should be monitored in cooperation with the University of Lausanne, in a way similar to the basic income pilot planned for the Dutch city of Utrecht, which is being developed in collaboration with the University of Utrecht. 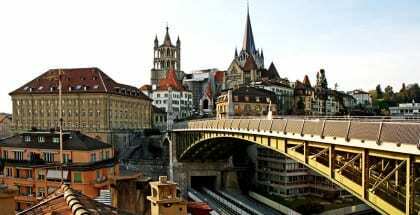 Lausanne is a city of 130,000 inhabitants located in the French speaking region of Switzerland. However, the experiment would include only a sample of the population. To run the experiment, the city will need financial support from the Canton and the Confederation. However, this is likely to be feasible, as it should not incur more costs than the existing budget for social benefits. The Lausanne experiment’s main goal would be to assess how work incentives change depending on the conditions for receiving social benefits, as Porchet explains on the website of the local section of the Green Party. We need more information about it. In Holland there is already a system of basic income that is working fine according to media reports so if it can work there it can work elsewhere. FYI, the link to the pdf is broken. ¿Cuáles son los requisitos para que un inmigrante argentino pudiera radicarse en Laussana teniendo acceso a esa renta básica?